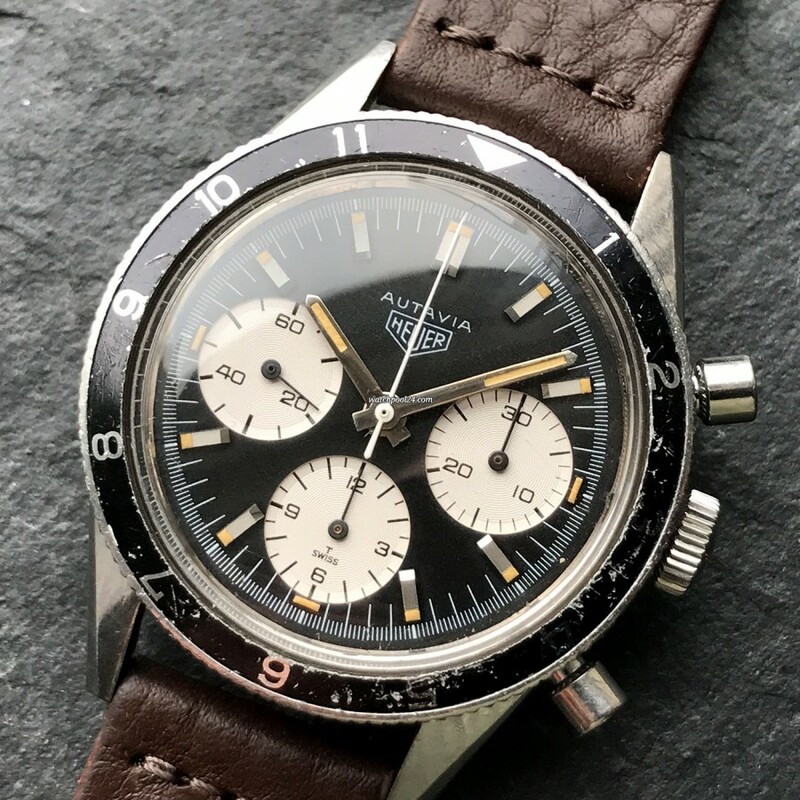 This Heuer Autavia 2446 is a 1968 racing chronograph. No less a person than the only posthumous Formula One world champion Jochen Rindt owned this model and wore it on his wrist during the races. Today, this watch is called "Rindt" Autavia and enjoys a high reputation among vintage watch collectors and lovers. This particular example of the reference 2446 is the screw-down case Autavia with the third execution dial. The reverse panda dial is in an absolutely flawless and pristine condition. The tritium luminous material is present in every element and 100% original. The 38mm case is in great condition with minor signs of wear and has remained unpolished, with sharp bevels on the lugs. The bidirectional 12-hour bezel has few signs of wear that give this Autavia an honest and true vintage look. The crown is original and "Heuer" signed. The manual Valjoux 72, one of the best movements of all time, is the heart of this Autavia 2446. All functions, including the small second, start, stop and reset functions of the chronograph, 30-minute counter and 12-hour totalizator run properly. Accurate and reliable timing is guaranteed with this movement. Whether you wear this rare Jochen Rindt Autavia on the racetrack or at work, it's a fantastic and reliable vintage companion.